A new build project based alongside phase one; Orchard Apartments. Both new build projects are on the site of a Manor House, originally an RNIB school and home for the blind. All three buildings are now a combination of high specification retirement flats and a care home building for the elderly. The location is also very impressive, based near the edge of the cliffs, with panoramic sea views over Thatcher’s Rock, across Torbay to Paignton and Brixham. This project is a high profile, specified building, based on an original Manor House site. Consideration to the environment was an important requirement for the new building, due to the location being within a coastal conservation area. The green roof will reduce the environmental impact and the effect on biodiversity by replicating the original footprint of the building. The combined synthetic Flag waterproofing and extensive Optigreen Nature Roof System was the perfect solution. Once the Nature System with sedum cuttings has fully established, the building will blend into the surrounding green forest areas and will continue to form an impressive contrast to the blues of the sea and coastal scenery. 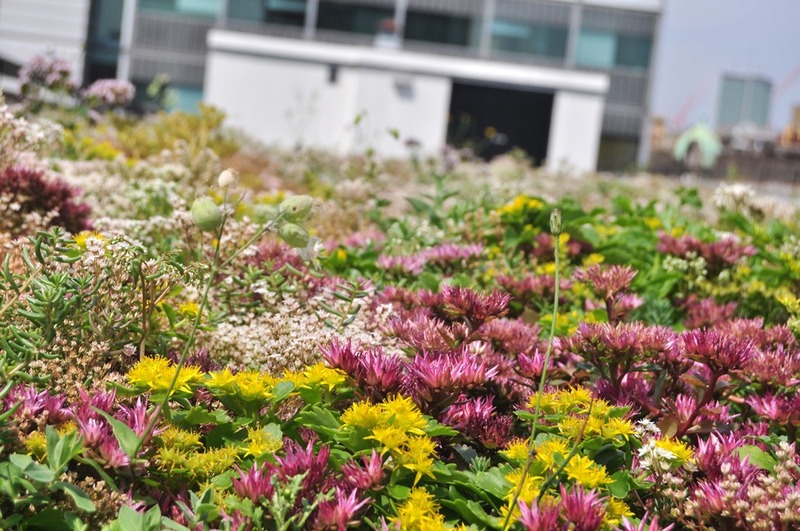 This project was a combined effort and success by Progressive Systems, who were the Main Roofing Contractor, and the installation of the green roof system by Landmark living Roofs, who specialise in Extensive, Intensive and Bio Diverse green roof systems. An excellent combination of skills from specialist roofing contractors, ensured the project was completed to an exceptional standard and all sustainability requirements were met. Scott Rogers from Mike Stacey Construction, the main contractor told Soprema how impressed they were with Landmark living roofs. They recommended that Landmark be involved with more of their projects due to their expertise and dedication to the project. At one point during the installation the weather conditions were extremely challenging, the crane would not reach across the entire roof and so landmark and progressive worked as a team to manually move all of the substrate and distribute it on the roof.